Runners from Leigh-on-Sea Striders sprinted into action to clear an area of Leigh of litter ahead of this weekend’s Leigh 10k. 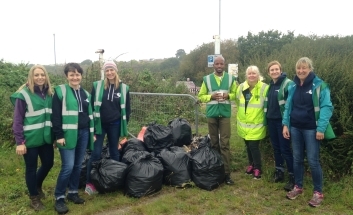 The runners were out on Saturday morning (7 October) taking part in a litter pick, arranged by LoSS runner Elisha Letley along with members of Southend-on-Sea Borough Council’s Make Southend Sparkle team. After being kitted out with high-visibility vests and litter pickers, they collected 26 bags of rubbish from Belton Way and the area behind Leigh station leading up to the skate park. The stash was made up mainly of bottles and cans abandoned in the hedgerows but there were also larger items like hub caps. The Striders have arranged litter-picks in the past but this one was specifically timed to tidy up the area before the Leigh 10k, which takes place this Sunday (15 October). Elisha said: "We live in a beautiful area and want everyone taking part on Sunday to see Leigh at its best." Cllr Ann Holland, Executive Councillor for Culture, Tourism and The Economy at Southend-on-Sea Borough Council, said: “I’m delighted that local runners gave up their free time in this way to make sure competitors and supporters get to see this part of Leigh at its finest. There are still a few places left for the 10k on Sunday, see the Leigh-on-Sea Striders website for entry details. And follow @litterfreeleigh to see details of any future litter picks Elisha arranges. You can find out more about Make Southend Sparkle and how to get involved by visiting our Make Southend Sparkle pages.